Add an Ethernet cable and you have a remote data acquisition system. Add a keyboard, pointing device, and monitor and you have a complete on-site workstation, as well as a full-service data acquisition system. You now can connect up to 32 strain gauges to a single solidly built box that conditions, acquires, and logs signals to disk. The system can process acquired data in real time as needed, as well as log raw or processed data to disk, and it can output control signals. You can extend it to create a synchronized data acquisition system with hundreds of simultaneously sampled channels of conditioned signals. The DAPserver and DAPserver "R" models – the latter for rugged environments – serve as fully integrated test, measurement, and control products. Built with experience gained over many years of integrating third-party hardware, these high-performance combined systems are now available as standard products, with the built-in value and quality engineering that go with all Microstar Laboratories systems. Each DAPserver comes preloaded with Linux or Windows, ready for installation of application software. 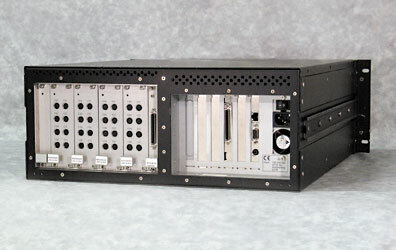 A DAPserver mounts in an industry-standard 19-inch rack, and includes a SATA hard drive. DAPcell client software can request data acquisition or control services, from DAP boards on any DAPserver, from any workstation connected to the same network. Input and output design conforms to Microstar Laboratories Channel Architecture. Factory-installed interfaces provide analog signal conditioning for strain gauges. They support quarter-bridge, half-bridge, and full-bridge sensors, with voltage excitation, gain, simultaneous sampling, and voltage sense feedback. You can specify gains of 20, 40, 100, 200, 500, and 1000. On each board, eight 8-wire connectors, one for each sensor, support a wide variety of connections with two to six wires per sensor. You supply bridge completion resistors, and place them on small quick-swap daughterboards. As with other Microstar Laboratories sensor interfaces, another daughterboard option provides an analog anti-alias filter for each channel. Get more details about the DAPserver system or talk to us about how a custom DAPserver would work for you.